PowerSlot and SportStop one-piece direct replacement rotors fit stock calipers. Drilling or slotting helps wipe away the debris that forms between the pad and the disc, adds more bite, and can help the rear brakes to match the aesthetics of a front big brake kit. 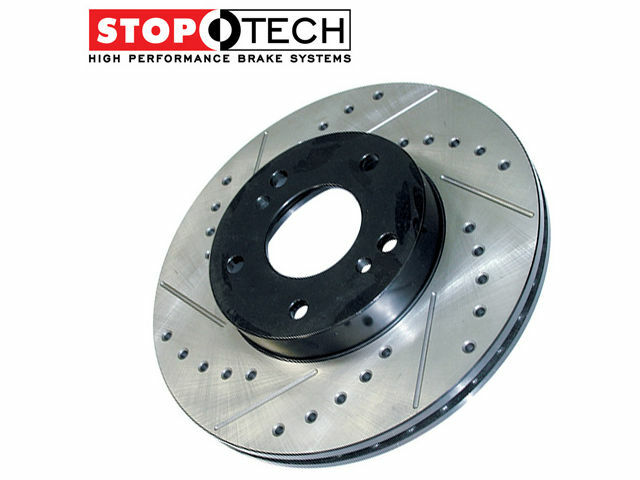 The rotor finish helps prevent glazing of the pads and improves wet and dry braking performance. StopTech and PowerSlot rotors have a durable black coating on the non-swept areas of the rotor to prevent unsightly corrosion.